How to import to Namibia? What are the import procedures in Namibia to move goods? Explain about import registration process, cargo movement to Namibia from overseas countries, Import delivery process in Namibia etc. Detail the import methodology in Namibia. This post explains about step by step procedures that need to be finished with Namibia government authority for importation to Namibia. Any Namibian organization or individual has the privilege to deal with merchandise import and export. A registered trade with concerned license as per the business is must for exporting and importing of commercial products from and into Namibia. According to products nature, certain goods for import/export may be subject to an authorization, license, rules of quality or packaging, standardization or special formalities. The Directorate of International Trade of the Ministry of Industrialization, Trade and SME Development (MITSMED) is accountable for coordinating the country's trade policies and overseeing Namibia’s involvement in international trade bodies. It is responsible for managing import/export procedures. All imports are subject to licensing, but most licenses are automatically granted but a limited number of products are subject to non-automatic licenses which requires permit from concerned authorities. The Directorate of Customs and Excise within the Department of Revenue Management under the Ministry of Finance is encompasses; protect the society with respect to the international movement of goods and people to collect control and secure revenue; to facilitate trade whilst exercising appropriate control, and to advance Namibia's interests regionally and internationally in these areas. This post explains about different phases in import process that every importer needs to go through in Namibia. 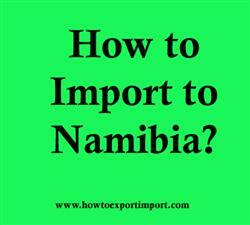 How to import to WALVIS BAY? Import registration procedures required in WALVIS BAY. Import Licence process in LUDERITZ. Process to import to WALVIS BAY. Formalities for import to Windhoek. Procedures to import to WALVIS BAY. Need to import to Windhoek. Explain to import to WALVIS BAY. Information to import to Windhoek. Step by step process to import to WALVIS BAY. Import Customs process in Windhoek. Process to import to Walvis Bay. Requirements of customs to import to Windhoek. Methods to import to Windhoek. Guidelines to import to WALVIS BAY. Please guide to import to Windhoek. Help to import to. Procedures required to import to WALVIS BAY. Requirements to import to Windhoek. Clarifications to import to WALVIS BAY. What are the documents need to be submitted to import at LUDERITZ port customs. Which documents should I provide at WALVIS BAY customs port location for import. How can I import to Windhoek. What should I do to import to WALVIS BAY. How to export from Namibia?